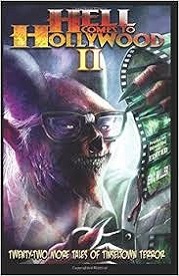 Purchase "Hell Comes To Hollywood II: Twenty-Two More Tales Of Tinseltown Terror (Volume 2)"
Two Los Angeles detectives struggle with a serial killer whose calling card is a pair of papier-mâché Mexican Clown Hands. “Twenty-two more tales of Tinseltown terror,” promises the tagline, and it does not disappoint. True, not ALL of the tales are about movies and the silver screen, but most of them are, and even those that aren't are still about the dream-chasing and star-making, the magic and mystery, the glittery facade and the sometimes darker truths behind it." "Mexican Clown Hands' by R. B. Payne is set contemporary but has an older feel, a gritty sepia-toned noir feel, resulting in a creepy and effective whodunit." "... "Mexican Clown Hands" (there's a gut full of brilliance here!)."